The Cuban people are inspiring. Despite the remaining debris, the electrical power that took a while to restore, the lack of gas and landline telephone service, the long – but fast moving – lines at the areas set up to provide food and refreshments; despite the faces still marked by the stress and trauma caused by the hair-raising force of the tornado Sunday, January 27, the enormous damages that it left behind and the anguish of those who lost their belongings, as well as their homes in many cases; despite all this, in front of the Diez de Octubre (Hijas de Galicia) Maternity Hospital, on the corner facing Luyanó Avenue, people crowded to greet the President of the Councils of State and Ministers, Miguel Díaz-Canel Bermúdez; to thank the Revolution for the support they are receiving in the aftermath of the catastrophe, and for the speed of the recovery work, and also to listen to his directions. This area of Diez de Octubre municipality was hit by the “Tornado of the Century,” as it is already being referred to. But in the midst of the debris and damage, of the dozens of workers of the Electrical Union, and their myriad of specialized equipment tightening cables, placing new utility poles and removing those damaged; in the midst of the hustle and bustle of local authority workers still sweeping and gathering rubble of all kinds, the people of Luyanó awaited the head of state. They paid absolute attention to what he said. “Be quiet, let us listen,” “Hey, make space,” they said to each other. There were no laments, but rather the will to push ahead, and confidence in the Revolution. 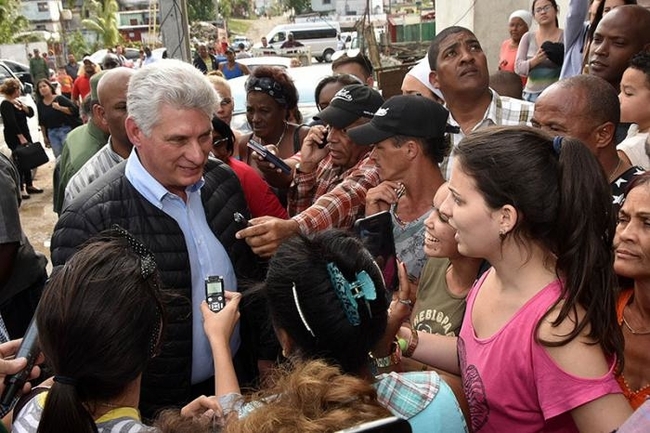 The Cuban leader verified the recovery work in the areas affected by the severe natural event, from the municipality of Diez de Octubre to Guanabacoa, including San Miguel del Padrón and Regla, where he talked with citizens. As always, the President was clear and precise on speaking to the people. He noted that some damages could be repaired quickly, such as to the electrical service, which was already almost fully restored by that point, but that some issues would remain pending, and take more time to resolve. It will not be a matter of a few days, but everything should end up better than it was before, he stressed. In some places, many complaints were voiced. As usual, Díaz-Canel listened, clarified, offered well-founded views, and gave directions that the issues be addressed. At the beginning of the tour, he had stressed the need to be very sensitive and understanding when dealing with the people, noting that some, due to the magnitude of their losses, could voice their frustration negatively. “This (the tornado) has been a hard blow, and we will recover,” he assured, adding that it will take weeks of intense work, and in some cases more, but noting that the immediate response has been positive. The Cuban President spoke of the efforts of Electrical Union workers; stressed that the remaining debris must continue to be collected; noted the priority awarded food supplies, and other actions that would continue in the days to come. “No one will be left unprotected,” he said. Díaz-Canel highlighted that the most complicated damages were to homes. He reported that construction materials were already reaching the affected areas and supplies would continue to arrive. He called for swift work to repair damaged homes, and for the participation of the people, state entities, and the family and friends of those affected. He also asked for support for the state workers working to repair damage. The first establishment visited by the President of the Councils of State and Ministers was the iconic Diez de Octubre Maternity Hospital, where he examined the repair work and the strategy being implemented for the prompt restoration of services. This was the Public Health institution most damaged by the tornado, amid 19 sector facilities, including ten family doctor’s offices. The hospital has a total of 286 beds, and attends to pregnant women from six surrounding municipalities. Work began on the rehabilitation of the hospital immediately, including the water and sewage system. “At the end of the works, we will have a better institution than before,” stated Minister of Public Health José Ángel Portal Miranda. The Cuban President, who was accompanied during the tour by Luis Antonio Torres Iríbar, first Party secretary in the capital, and Reynaldo García Zapata, president of the provincial government, next visited a construction materials sales point, set up on Luyanó Avenue, where he inquired about the materials already available and those that will continue to arrive. The President of the Councils of State and Ministers also visited several economically important sites that were damaged by the tornado, such as the Comprehensive Automotive Services Enterprise (CEISA), in San Miguel del Padrón, and the Vanguardia Socialista basic enterprise unit, affiliated with the Varona metallurgical enterprise. The President’s tour continued in the warehouses of the Gepalsi Carpentry, Metalwork and PVC basic enterprise unit, located in the municipality of Guanabacoa. “Here is the greatest destruction I’ve seen today,” he said as he walked through the rubble of what was, according to someone present, brand spanking new before the tornado struck. Those in the homes surrounding the enterprise constantly shouted out to the President. From a small hill, residents waved, while he gestured that he would soon go to speak to them. After leaving Gepalsi, Díaz-Canel headed along the path that led up to houses in the Chibás neighborhood. He spoke with the people there, asked if they had already been visited to record their needs and they answered yes. The biggest problem, they noted, was garbage collection. Díaz-Canel instructed the leaders who accompanied him to help to resolve this issue. Minutes before, we were witness to another anecdote that deserves to be recalled. As he left the emblematic Vanguardia Socialista installation, two women signaled to the President, and he got out of his car to listen to them. They told him about the destruction of their homes, the loss of almost all their belongings, and expressed their confidence that the Revolution would provide solutions. “Where do you live?” asked Díaz-Canel. “Down the Avenue,” they responded. They looked overwhelmed. Díaz-Canel placed a hand on their shoulders, explained the strength of the tornado, that several thousand people had been affected in Havana, that the first tasks have been to remove the rubble, and little by little restore water, communications and electricity services, and that construction materials were already arriving at sales points. He asked for calm. Meanwhile, they understood that, just 72 hours after the tornado, a lot had already been done.